Thanks to some rumbling in the distance I had to take my workout back to the pool at the Y. Usually I find it depressing to come back to the pool after a big open water swim. But this time I didn't mind. The pool is still the best place for the kind of interval work I do in my monday workout. My mom, who lives just a town away, is also a regular at the Y. Turns out mom had been bragging on me to the staff. So there were congratulations for me on my way out of the locker room. This post serves as a test. I want to use my shmancy phone to post pictures. 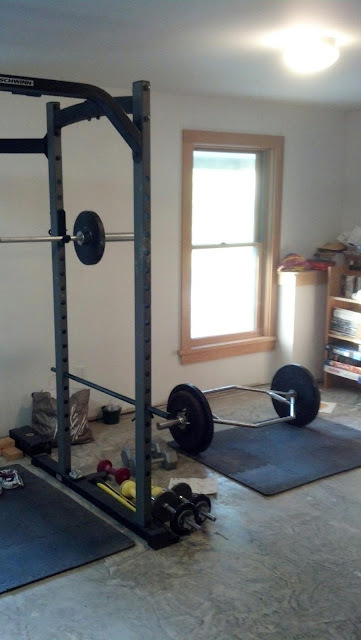 So here is one of my garage gym. As I'm swimming I see a head in a blue swim cap pop up between me and the kayak. It was Grace. She had jumped in to pace me for a while. She circled around to my left hand (port) side. And just like that, still tired, and a little cold, I was having so much fun. I felt like a genuine marine mammal. It was awesome. How could I possibly be having so much fun? Apparently I picked up the pace while Grace was swimming with me. I did not know it at the time. But apparently there was actually a race going on and I was in it. Sometime after Grace left, I saw a red kayak come up on my left. And then it fell back out of sight a few breaths later. Five or six times the red kayak appeared and then fell back before it finally pulled ahead. There was one more feed. The bridge was so close. But I wanted that juice anyway. Margrethe told me if I sprinted I might be able to catch Hannah again. I wasn't sure I had a sprint in me. But it was too late for witty repartee so I just swam for it. I still kept wandering off to my left and trying to correct it. I had been so good all race long about not picking up my head to sight. I put my trust in Margrethe, my kayaker, and she delivered big time. But now I was starting to see the Newburgh Beacon bridge every time I took a breath on my left side. It was definitely not moving any closer. I know I probably shouldn't look at it at all but now I could see it without even trying and it was definitely not moving any closer. In fact despite my best efforts it looked to me that it was actually getting further away. And then finally I could see the bridge when I took a breath on either side. Then I knew that it was not actually getting further away at all. The sun must have been low enough in the sky. Because I swam through the shadow of the northern span of the bridge and came back out into the sun before I actually started swimming under the bridge itself. I could feel the shadow as much as see it. It felt cold. Now the Newburgh Beacon bridge is a double bridge. There are two separate spans about 40 meters apart. Swimming under it actually takes around a full minute. Margrethe kept signaling and waving me on. Then I saw Agent Orange on my other side. My ears were full of water so I couldn't really hear but I think there was some cheering and waving on board. I made sure that I was completely clear of the southern span before I stopped swimming and looked around. "How do you feel" Margrethe asked me. "Tired. Hungry. and a little cold"
I swam over to Agent Orange. They dropped a ladder into place. I grabbed on to the ladder and for just a moment I wondered if I would be able to climb out. But I managed ok. They wrapped me in a towel and I sat down in the sun. I knew the finish had been close but I didn't know quite how close until I watched the video later. I was obviously more bothered by the cold than either Todd or Hannah. Because I was the only one curled into a ball next to the heater in the cabin of Launch 5, wearing all my warm clothes, sipping a small nalgene of hot coffee with milk. By the time we got to the dock I was mostly warmed up again. Gayle was waiting on the pier with our little guy. She greeted me with chocolate. When I woke up in the morning I checked the data. The water temperature read 63 in Poughkeepsie. Just before we left the dock on Launch 5 the temperature read 64.4 This was encouraging, even though that is still pretty cold, for me. I figured if the sun stayed out the water would continue to warm up and I might actually be able to get through this swim. I had prepared some hot feeds, something I had never worried about before. We motored out from the dock to just north of the Mid Hudson bridge. There was no countdown, no big ceremony. We got a two minute warning on the way out and then as soon as we were in place we got the "go go go"
We went. One two three. I know I am still not well calibrated when it comes to judging water temperature. But I am convinced that water was colder than 64 degrees. I figure the boat had just cut through where we were swimming and stirred up some colder water from deeper down. For a few minutes I couldn't even think about the cold. I was just thinking about breathing. Every time I put my face in the water I triggered some kind of gasp reflex. I had to forcibly exhale in order to stop myself from taking in a lungful of Hudson. Thankfully this sensation did not last long. The water still felt cold but I felt ok. At my first feed I got one of my regular juice bottles because the water was measuring 67 degrees. Mostly 67 anyway. There were still some cold patches. The debris in the river didn't seem that bad. But that might have been because Margareth was steering my around the worst of it. My first problem was a log that I swam into. I pulled back, not knowing what I had hit, and the sudden movement made my leg cramp up. I was annoyed at my leg. This was only an hour, hour and a half into the swim. Way too early for cramps. After I few tries I pulled the cramp most of the way out and I started swimming again. The cramp shook the rest of the way out within a few kicks. I quickly lost track of distance covered, I lost count of feeds. It felt like the cold patches in the water were getting bigger. I kept pulling to my left. I kept trying to correct but I still kept pulling to the left. Margareth checked on my leg at each feed for a while. It didn't cause me any more trouble. At some point, long after I had lost track of time, I'm guessing between the three and four hour marks I told her. "My thumbs are cold"
Maybe it's weird, but my thumbs will get cold long before any of my other fingers. By my next feed, or maybe it was two feeds later, my fingers were starting to get cold and tingly. There seemed to be three distinct temperatures in the water: there were occasional patches that actually felt warm, most of the water felt cold, and some patches felt so cold I just could not understand it. I'm curious how much of a temperature difference there really was. It felt huge. I had actually gotten a look at the Newburgh-Beacon bridge during one of my feeds. I felt like I would get there but I didn't know how much longer it was likely to take. And I most definitely was not going to ask. Did about a mile in Prospect lake today. 70 degree water felt so comfortable. Big group, very nice lake. I have to remember to add some pictures here. I'm still a little sore from Monday (big surprise) but it felt nice to be able to get back in the water so quickly. I'm trying to write up my experience on stage 3 this monday. It is taking me a while because at first I kept falling asleep at the keyboard. I always get very congested after a long swim and I usually need to wait a whole day before I can get the kind of dead-rock sleep that I want after an event like that. I feel like I should have a whole post or maybe a series of post where I talk about how amazing the organizers, support crew, and kayakers are at this event. All I had to do was swim. I got to sit this one out because I don't want my legs to be sore for my big swim tomorrow. Wifey lined up for the race while the little guy and I played around in a wiffleball stadium known as the thunderdome. They were doing music and announcements from the top of a little tower by the aforementioned thunderdome. When I heard them start playing "the eye of the tiger" I grabbed the little guy and walked over to the finish line. The official clock read 20:38 at that point. Wow, tough course. Wifey came in 4th woman and 18th overall finisher. She got a medal for winning her age group. Then we got to go down the giant slide. Met up with the folks from massachusetts for a wednesday swim. The thermometers disagreed about the temp. One said 62 the other said 66. We swam just about a mile. I'm not very well calibrated on temperature but I think it was less than 66. Anyway I had to bundle when I got out. Once, in college, I jumped out of a perfectly good airplane. The scariest part of skydiving, for me, was not hesitating at the airplane door at 12,000 feet counting to three (actually 2 a little trick of the instructor's) The scariest part was looking out the window at about 6,000 feet and thinking that was already pretty high. Standing on the beach at Sandy point State park waiting for the start was fine. But riding the shuttle bus over the bridge actually got me pretty nervous. Rule number one: Do not let the bridge psych you out. At Sandy point park we had real bathrooms instead of just porta-potties. I had plenty of time to grease up and get ready. The race director said the water temperature was 76 degrees. Nearly everyone was wearing a wetsuit. To be fair I think it was a little colder out in the middle. In this case a little colder might have been 72. I don't think of myself as an anti-wetsuit guy. So far I've done all my swims without, but some people don't and that's ok. But at 76 degrees I'm amazed that some 85% of the swimmers are still wrapped in neoprene on a fine sunday morning. The course stays between the two spans of the bridge for nearly the whole distance. The tide pushes you first to the left and then to the right. This mostly wasn't a problem. Post race emails indicate that the current was very strong. I didn't really notice while I was swimming but It might have had an effect on my swim time. The tide may have been pushing me around without me really thinking about it. I started following more or less the left span of the bridge, moved out into the middle around the halfway point, and then found myself over towards the right for the last mile and a little more. I had heard terrible things about the cuisinart start. This is the largest open water swim on the east coast and we start in two waves of around 300 people. It really wasn't that bad. It was very crowded and took a long time to open up but the other swimmers were very polite about all that contact. I have already been to a few races where much smaller groups resulted in worse starting conditions.